Craig Elmer “Owl” Chapman didn’t like his profile in The Surfer’s Journal so he sued. 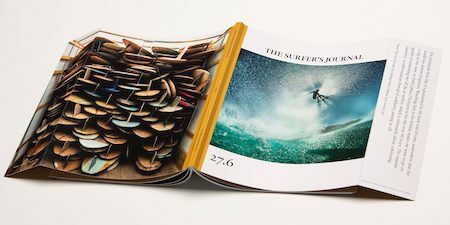 Now a federal court in Honolulu has decided that The Surfer’s Journal profile written by Jeff Johnson was not libelous, according to a story in Pacific Business News. Looks like the truth is a savage taskmaster. Thanks to Steve Pezman for fighting to good fight for writers and publisher everywhere. In a time when stories rarely make it into action sports magazines without first being vetted by the companies who paid for the trips it’s interesting to follow Scott Bass’s Surfermag.com story of Owl Chapman’s lawsuit against The Surfer’s Journal. Wait, isn’t that how it always is when buying a custom shaped board from a genius shaper? 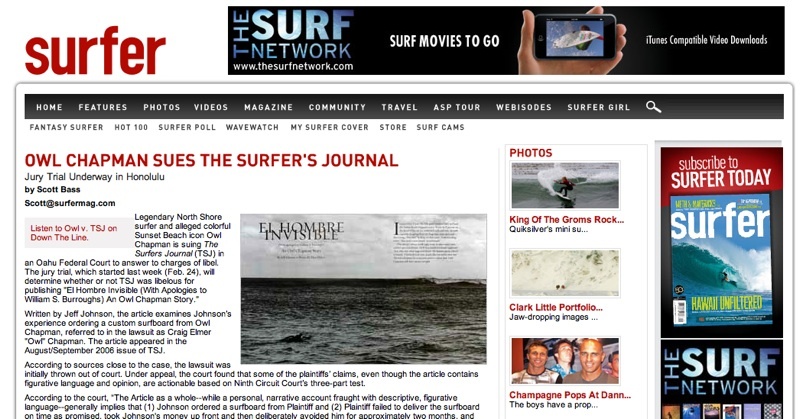 Looks like The Surfer’s Journal is joining the digital age with a couple Tyler Manson video clips on Vimeo. Apparently, someone under 40 works at TSJ now. This clip features a little quiver swap between one of the Malloys and Dane Reynolds. Ride shotgun with Dan Malloy and Dane Reynolds as they cruise from their Ventura homes to Emma Wood State Beach for a quiver swap. This insider look at their modes of surfing comes to a head as they trade—and ride—everything from homemade hunks to foiled Fryes. 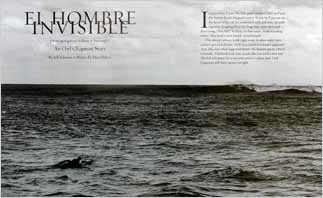 Surfersvillage and Global Surf News have always bummed us out a little. Their “we post everything and don’t care who we steal it from” mentality made for some great fun in the early days as online editors at certain surf magazines delighted in posting completely bogus stories just to see how quickly the seemingly irony impaired minds behind Global Surf News would pick them up and run with them. Remember the Rip Curl Search at Swami’s story? We haven’t seen the $65 book yet (the official launch party is April 9, 2009 at Bells), but the idea seems perfectly timed. The artist/filmaker Thomas Campbell aka T Mossian has a new book out titled Slide your Brains Out. The first of ten projected volumes in Um Yeah Press’ surf photobook series, Slide Your Brains Out compiles work from the past 15 years. Often lo-fi and gritty, other times lush and saturated, Campbell’s compositions–which include portraits and action shots of some of the best surfers in the world–are always surprising and full of emotion, from melancholy to exultation. 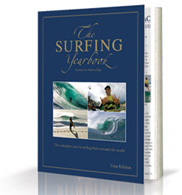 The book features a foreword by The Surfer’s Journal’s Scott Hulet and an afterword by Ed Templeton and if available for purchase at the Mollesk Surf Shop website for $39.95 or on Amazon for $26.37 with free shipping. Ross Garrett (right) the former Director of Operations and Development for The Surfer’s Journal has been named Vice President of Surf Products for Surfline.com. Also joining the Surfline.com team in Huntington Beach, California is new Global Forecast Development Manager Mark Willis. “Ross and Mark are each incredibly talented and well respected within the unique surfing and ocean-based meteorology markets we serve with Surfline and Buoyweather. We are excited to have them both hit the ground running to help continue to drive the growth of our products,” said CEO Jonno Wells. Sad news from Mavericks. Hawaiian big wave surfer Sion Milosky, 35, reportedly drowned at approximately 6 PM Wednesday, March 16, 2011, while surfing the Northern California big wave spot, according to a story in the San Francisco Chronicle. “He went down the face of the wave. He made a bottom turn and he totally made the wave, but the water caught up to him and it just kind of engulfed him and raced him down,” said the surfer, who did not wish to be identified because he had taken the day off from work but did tell his employers that he would be surfing. . . “The last image I have of him was of him standing on his board as the whitewater was kind of engulfing him,” he said. Mikosky’s body was reportedly found by Nathan Fletcher near the Pillar Point Harbor mouth. 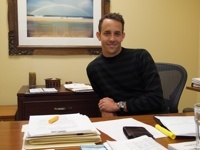 Milosky was pronounced dead at Seton Coastside Hospital in Moss Beach. He leaves behind a wife and two daughters. Milosky, described by Transworld Surf as “one of (if not the hardest) charging surfers in the world)” was featured on a recent cover of Transworld Surf Magazine’s Tales From The North Shore issue. Our thoughts are with Milosky’s friends and particularly with his wife and daughters. Click here for a little more background on Milosky and his getting into one of the biggest waves ever paddled into (Abstractlines.TV via The Surfer’s Journal). We learned today from a Scott Hulet story on The Surfer’s Journal that big wave surfer and industry legend Phillip “Flippy” Hoffman died early this morning (November 10, 2010) in Mission Viejo, California. Hoffman had reportedly been battling “unspecified pulmonary issues.” He was 81. Born in Glendale, California in 1930, Flippy (as the surfing world knows him) was a member of the first wave of California surfers to chase big Hawaiian surf in the 1950s. 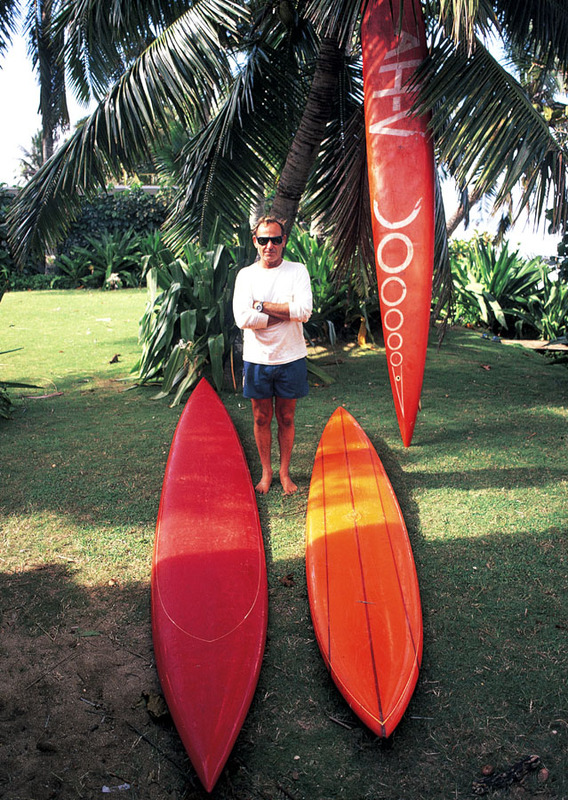 Along with his roommate, Bob Simmons, Hoffman was the first mainland surfer to take up residence on the North Shore of Oahu. . . Along with his brother, Walter Hoffman, Flippy owned and operated Hoffman California Fabrics, a custom textile house supplying California surf brands. 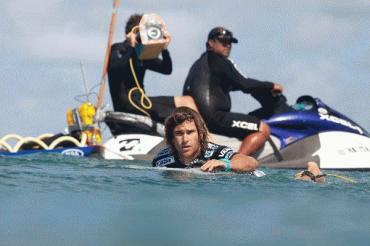 The Hoffmans are one of the world’s foremost surf families. Flippy will greatly be missed. Our thoughts are with his family and friends. Click here for more info. Cloudbreak And Restaurants Free To The Public? Surfing areas around the country are now open to anyone who wants to use them under the new Regulation of Surfing Areas Decree. . . In the past some top surfing areas were restricted by hotels or resorts that had leases over the area and imposed payment and conditions for their use. The Decree cancels any existing instrument of title, including any lease or license – without payment of any compensation. Sayed-Khaiyum hasn’t decided exactly when this new decree is going into effect so don’t start packing yet. 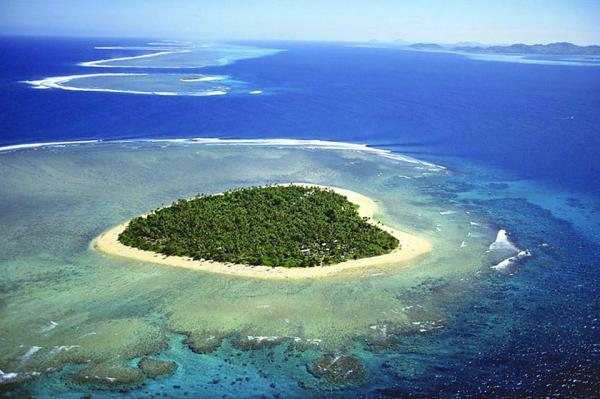 We can say this–-having surfed Tavarua’s waves while the entire Fijian parliament was being held hostage at gunpoint for 58 days by George Speight, we don’t think Cloudbreak and Restaurants are in any danger of getting barged anytime soon. In other Fiji news Aiyaz Sayed-Khaiyum (who is also reportedly “responsible for the Justice Ministry and Attorney General’s Office”) has also decreed that every person in Fiji who has a phone must provide a photograph of themselves along with all personal information or their phone service will be terminated.